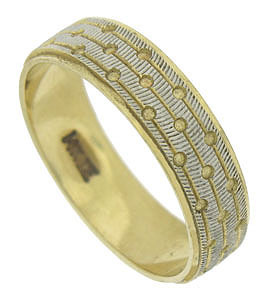 Layers of engraving cover the surface of this handsome 14K bi-color mens wedding band. Three rows of ball and string engraving rest atop a pattern of curving lines. Deep engraving on the white gold surface exposes the yellow gold band beneath. 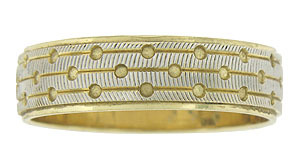 The estate wedding ring measures 5.95 mm in width. Circa: 1960. Size 10. We cannot re-size.